India is proudly celebrating its 70th Independence day today and we are very happy to wish you all a very Happy Independence day. 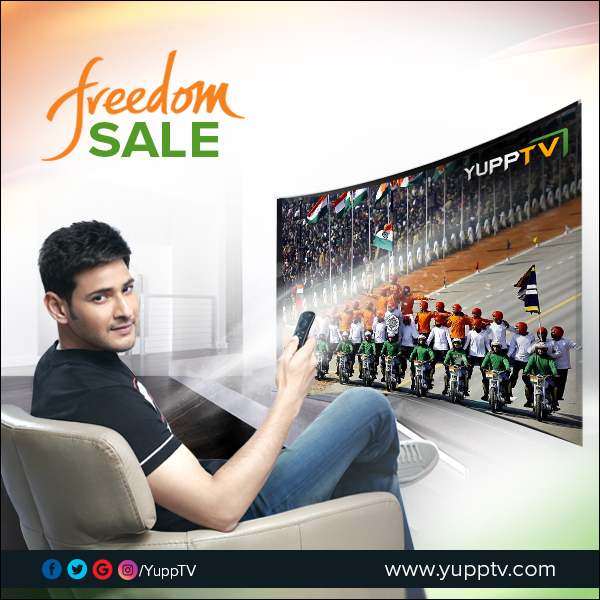 On this auspicious occasion, YuppTV brings you discounts on all the TV Channel subscription packages in the entire world. The South Asian content provider has put out its best offer which gives you 50% discount on the packages that cover the major channels from various languages. Let us check out some of the best things about this offer. The offer which is a rare one gives you the top channels from different languages at half the usual price. The offer is available Globally and the channels that are offered in the package differ from one country to another. But the basic price of the package offering the most popular channels has been cut off by half allowing the audience to get maximum entertainment for a bare minimum price. The offer covers packages which contain the Top and most popular channels from Hindi, Tamil, Telugu, Malayalam and other languages. Major channels like Star Plus, Colors TV, Zee TV, etc., from Hindi, Star Maa, Gemini TV, ETV, Zee Telugu, etc., from Telugu, Tamil one, Sun TV, etc., from Tamil, and channels like Asianet, Colors Kannada, and other similar channels from languages like Malayalam, Gujarati, Punjabi etc., too. Apart from these the packages featured, give you plenty of free channels and news channels also which will make them complete giving no place to the dissatisfaction of leaving behind what you want. You will be able to catch the Flag hoisting and the speech of the Prime Minister of India at the Red Fort live with the help of YuppTV. Get access to all the news channels now at the lowest price ever. With the 50% discount offered on the packages, the major news channels from diverse languages are available for you to watch from anywhere in the world. The offer is available only for a month. Grab the discount as soon as you can and enjoy watching Indian Channels at half the price for an entire year. Check out the newly introduced packages here. Happy Independence Day.